JPMorgan (JPM) reported record earnings last week with strength across all major lines of businesses amid a “more constructive environment”. The stock jumped 4.2%, the biggest one day move since Nov 2016. 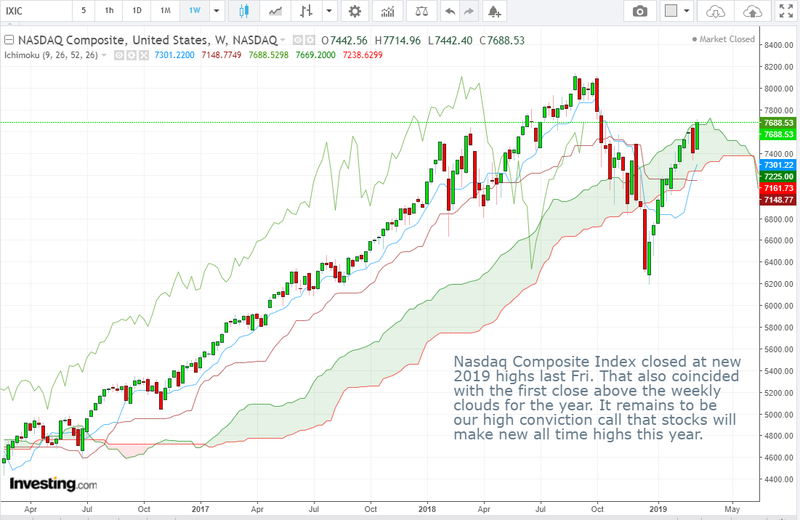 With a close above the weekly Ichimoku cloud within reach, all signs point to an impending melt-up in stocks. Despite market pricing expectations of rate cuts by the Federal Reserve, Gold is weakening against the USD. 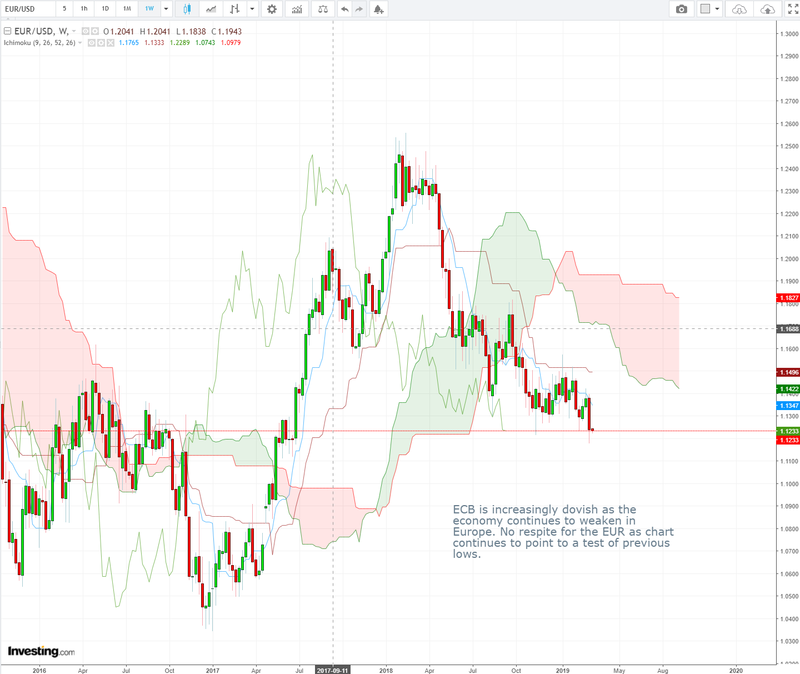 XAU/USD has closed below the Daily Ichimoku Cloud for the first time since late last year. If it stays below the cloud, and breaks decisively below 1270-80, the next target would be the low 1200s. 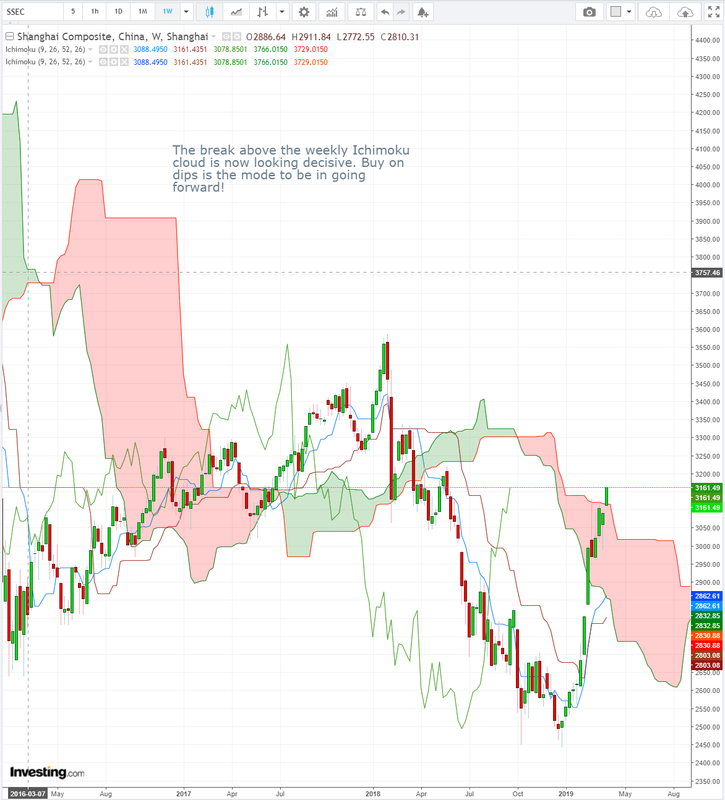 The break above the weekly Ichimoku cloud is now looking decisive. Buy on dips is the mode to be in going forward! 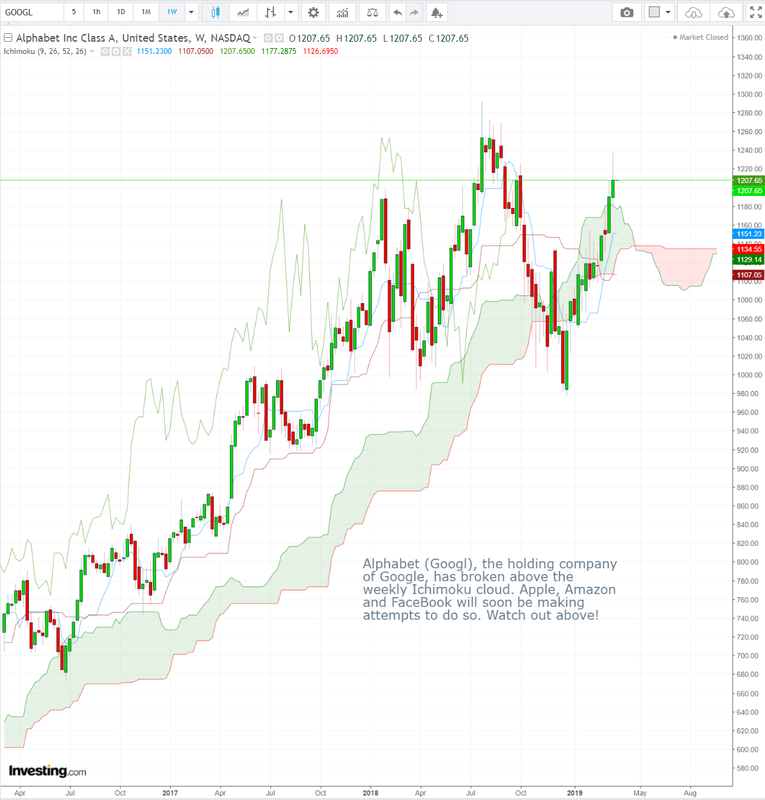 Alphabet (GOOGL), the holding company of Google, has broken above the weekly Ichimoku cloud. Apple, Amazon and Facebook will soon be making attempts to do so. Watch out above! ECB is increasingly dovish as the economy continues to weaken in Europe. No respite for the EUR as chart continues to point to a test of previous lows. 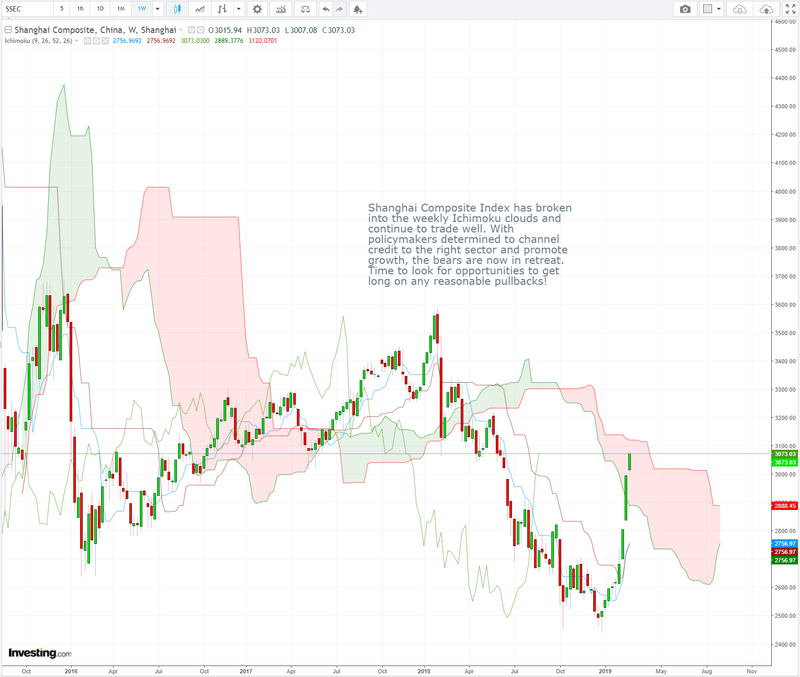 Shanghai Composite Index has broken into the weekly Ichimoku clouds and continue to trade well. With policymakers determined to channel credit to the right sector and promote growth, the bears are now in retreat. Time to look for opportunities to get long on any reasonable pullbacks! Want to keep in touch with daily market movers through a quick 2 min read? Click here to do so! 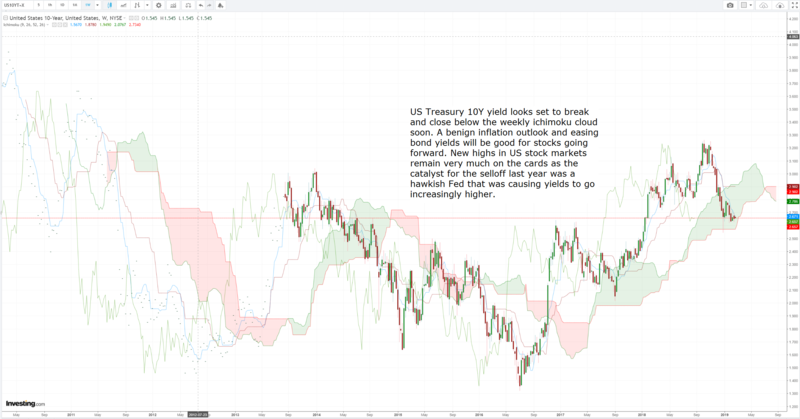 US Treasury 10Y yield looks set to break and close below the weekly ichimoku cloud soon. A benign inflation outlook and easing bond yields will be good for stocks going forward. New highs in US stock markets remain very much on the cards as the catalyst for the selloff last year was a hawkish Fed that was causing yields to go increasingly higher. Trade Opportunity: S&P500 index breaks and closes above the weekly ichimoku cloud for the first time this year. S&P500 index breaks and closes above the weekly ichimoku cloud for the first time this year. As we have been saying since the start of 2019, new highs will be seen this year. Investors came into the year very underinvested and the longer the index stays positive on the year, the worse it gets for those who are not involved. 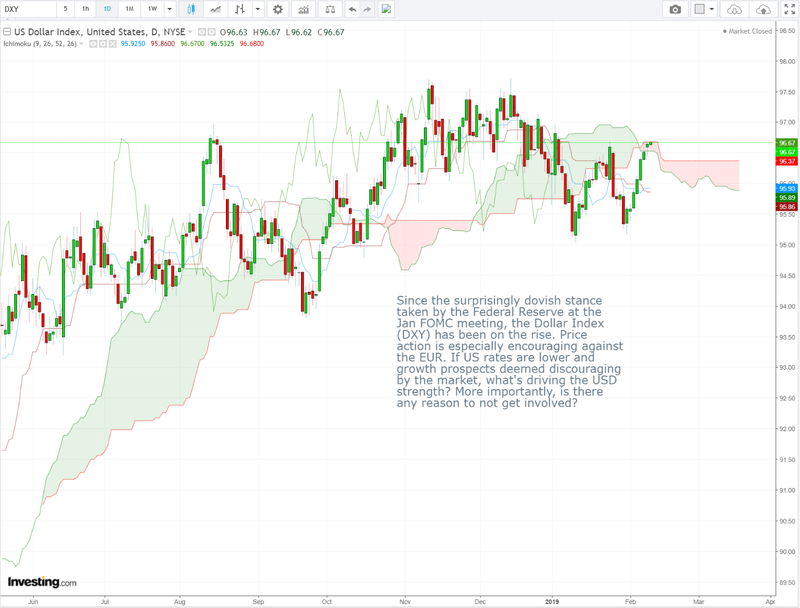 Trade Opportunity: DXY – Since the surprisingly dovish stance taken by the Federal Reserve at the Jan FOMC meeting, the Dollar Index (DXY) has been on the rise. Since the surprisingly dovish stance taken by the Federal Reserve at the Jan FOMC meeting, the Dollar Index (DXY) has been on the rise. Price action is especially encouraging against the EUR. If US rates are lower and growth prospects deemed discouraging by the market, what’s driving the USD strength? More importantly, is there any reason to not get involved?